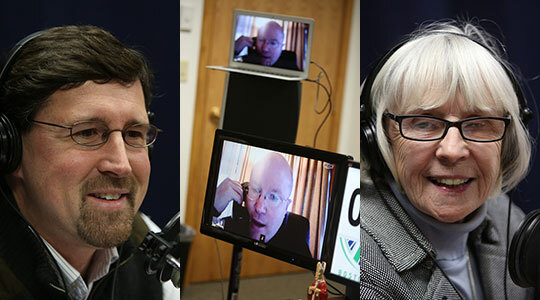 Summary of today’s show: Our usual Thursday panel of Scot Landry, Susan Abbott, and Fr. Roger Landry return after the Thanksgiving hiatus to consider the news headlines of the week, including Fr. Roger’s column in the Anchor this week on the Four Last Things: heaven, hell, death, and judgment; Pope Benedict’s newest book on Jesus and the Infancy Narratives of the Gospels; Advent as a time of preparation and how fasting can play a role in that; Cardinal Seán’s upcoming Mass that will include a Rite of Blessing of a Child in the Womb; and a recent three-part story in the Boston Herald on those still holding vigils in closed parishes. 1st segment: Scot Landry welcomed everyone to the show and noted to Susan Abbott that it’s tough to miss a Thursday news show because of Thanksgiving. They caught up on their Thanksgiving holidays. Scot welcomed Fr. Roger Landry and Gregory Tracy to the show. Scot said at the end of November we begin to think about Advent and he said in this week’s Anchor, Fr. Roger wrote a column on the Last Things. He asked Fr. Roger for a brief overview. He addressed the question quite frankly that our culture believes that all nice people end up in heaven. Fr. Roger said the Church calls the last things: Death, Judgment, Heaven and Hell. How we approach those things says a lot about us. He said there’s a lot less frequent meditation on these things because a lot of Catholics behave as if judgment and hell are irrelevant because they think no one will be judged and no one will go to hell. They believe that everyone who dies gets an A+ in life no matter how they lived their life. One of the great temptations of the devil is that life doesn’t really matter. But Jesus talked clearly that if you take a snapshot now of people going to heaven versus those on the road to hell, there are far more on the road to hell. One of the reasons he died on the cross was to get us off that highway to hell and onto the path to heaven. Jesus talked about as much about hell as about heaven, not to scare us, but to teach us that hell is radical possibility for human freedom and we should use every choice to choose heaven and to choose God. Scot said it seems that society has become accustomed that any good person will go to heaven because how could a good and loving God not show that mercy to us. Susan said it’s not what Jesus said. He said if you love him you will follow his commandments. She’s reminded of the presentation in RCIA on morality and how her pastor says our fidelity to God, our thanks for the gift of his love, is to abide by his morality. And if it’s the case that only those with post-doctoral degrees in Satanic wickedness are candidates for the eternal hall of shame, then, at a practical level, we can all just calm down. because very little now matters to our or others’ eternal destiny. It doesn’t matter if we spread the faith, because everyone gets to Heaven whether or not they know Jesus Christ. The Sacraments don’t matter. The Word of God doesn’t matter. It doesn’t matter if we pray or play, if we keep or break promises, if we steal or sacrifice, if we come to Mass or sleep in, if we’re faithful to our spouse or cheat, if we provide for or neglect our family. if we forgive or settle scores, if we love or abuse the poor, or if we welcome or abort the littlest of Jesus’ brethren. None of this matters – or at least none of it matters much. Since almost everyone in the class is going to make the eternal honor roll no matter what they do, while we may still admire those who study hard , the really wise ones are those who eat, drink and he merry and still get their easy A.
Greg said he sees this not only in the Church but also in general society. There’s a lot of rush to say everyone’s good, and everyone’s fine and everyone gets a trophy just for showing up. People get confused between the idea that God loves and God loves everything that they do, which isn’t the case. Scot said Fr. Roger asks two provocative questions: How is hell consistent with God’s love for us? And if we’re to forgive seven times seventy, then doesn’t hell suggest that there’s a limit to His mercy? Fr. Roger said this one of the reasons people think there just couldn’t be a hell. They can’t imagine a loving Father sending them to a place where they will be tortured for eternity. His response is not part of God’s original plan because everything God created was good. He gave us freedom which can be misused. Sin, suffering, death and hell are the creation of everyone who excludes God and his love. Jesus came into the world, not to condemn it, but to save it, yet the one who rejects him has a judge. Those who reject Jesus’ word become their own judges. He quotes C.S. Lewis: “‘There are only two kinds of people in the end. Those who say to God, ‘Thy will be done,’ and those to whom God says, in the end, ‘Thy will be done. All that are in hell choose it.” The Catechism defines hell as definitive self-exclusion. We who in our life say we don’t want to have anything to do with him send ourselves away from him. Susan said one of the most vivid examples from literature is Dante’s Inferno which depicts people living out their choices from life for eternity in hell. Scot said no one likes to talk about hell, but the Church gives us these topics at the end of the liturgical year to keep these important facts in mind, that we are accountable for our actions at the end of our lives. Susan said it’s not enough just to know about God, but we must know God Himself, and we do that through the sacramental life of the Church. And when we know God, we follow him. As we move in Advent, a season of joyful preparation and home, and recall the first coming of Christ, we also are reminded of the second coming at the end of time and we should pray to transform our hearts into mangers to receive him. Scot noted that the Holy Father is helping us prepare through his new book just published on the infancy narratives of Christmas. And the secular media has gotten much of what the Holy Father said wrong. What the Holy Father says that got the most attention is not consequential, like the Scripture never tells us whether there were animals present or if Jesus was born in 1 A.D. or on December 25. First of all, the important fact is that Jesus was born at all. The little details of the scene, what order they appeared in, whether shepherds were present in the stable, help us to imagine the scene, but don’t change the fundamental reality. Scot said the reports are missing the most important aspects of the story for the little details. Susan noted that there a lot of things people believe the Bible says that it doesn’t actually say. Fr. Roger said every Catholic should read it and anyone with a high school education will get something out of it. The Pope is not writing a theological treatise, but something for everyone. The Holy Father did a particularly good job on the genealogies from the beginning of the narratives, making them really intelligible. For anybody who prays the rosary, this is great meditation material for the joyful mysteries. Fr. Roger said he was shocked when Pope Benedict talked about Mary asking Gabriel how she would conceive a child and gave a different approach to the situation than one usually hears to explain it. Scot said that brings up a helpful thins about this book. It’s unusual for the Pope to write a book in his personal capacity. This book does not come with the guarantee of papal infallibility of an official teaching of the Church. Greg said there’s a lot of confusion surrounding the doctrine of infallibility, even among Catholics. There are very specific instances in which papal infallibility apply. Susan said that even so, even before he was Pope, the Holy Father was one of the most highly respected theologians. Scot said it’s great that the Pope wants to continue to teach in this way and that he’s willing to take the same risks as any other teacher or professor in writing about the faith and speculating on what these ideas mean. Also in the Pilot is a story about a day of preparation for Advent about fasting as a way of preparing. Greg said it was a retreat called Prepare the Way for the King and was connected to Andy Lavallee, a local baker who was developed a special kind of fasting bread (see the previous show on The Good Catholic Life.) Advent is not a time we traditionally think of as time of fasting. He said Advent is a penitential time. In previous eras, Advent was six-weeks long and involved fasting and abstinence. Scot said the busy-ness of December for most people today makes it tough to prepare for Christmas unless you intentionally decide to slow down and prepare. Susan said when we fast from food, we don’t just think about our next meal, but we spend it in productive contemplation. Scot said in another story Cardinal Seán on December 16 will conduct at the Cathedral of the Holy Cross a rite for the Blessing of the Child in the Womb at 11:30am. Scot said that is Gaudete Sunday. Fr. Roger said the US bishops had written a special blessing that they submitted to the Vatican for their approval. Priests had blessing for almost everything but not this and they wanted to cover that gap especially in this culture where abortion is so prevalent. It also gives us an opportunity to show how we should be praying for those children in their womb and their mothers and fathers. The whole Church can rejoice with these women. Fr. Roger said when he sees an obviously pregnant woman he will offer to bless the baby. On a few occasions, he’s felt the child kicking as he used his thumb to trace the sign of the cross on the mother’s stomach. On occasions when it’s a difficult pregnancy, those blessings have meant a lot to him and the couple. Now he’s grateful he doesn’t have to wing it. for more information on this Mass and the Blessing, contact the Pro-Life Office through BostonCatholic.org. He wins an audiobook about St. Kateri Tekakwitha. 3rd segment: In this segment, we’ll be talking about three cover stories on the front-page of the Boston Herald this week about three churches where people remain in vigil after 3,000 days after the parishes were closed. Scot said he wanted to talk about this because they get some aspects of Catholic teaching wrong and that some critics claim that the new pastoral plan, Disciples in Mission, is just more reconfiguration and closing of parishes. Scot said it’s just not true. This plan is about providing more resources and support for evangelization and no parishes are slated for closure. In Monday’s story, they covered St. Frances in Scituate and the vigilers claim that this is their church built by their ancestors and that the archdiocese has no right to take this church from them. Scot said it’s not a Catholic worldview. It’s a congregational view. The Church is not a club. The Church is one worldwide Church and the bishop is a steward of the Church’s resources and is tasked with ensuring there’s enough resources for everyone to have the sacraments. Greg said this mentality is a kind of Americanism and it’s an idea that we can each define what it means to be Catholic for ourselves. He said he understands their visceral reaction. He recalls how something he had given to his parish had been given away to someone else, but he realized that when he gave something, he had given a gift freely. Scot said he offered it without condition. Greg said many of these people speak about those who built the churches and he wonders what some of those forebears would say today about those who are acting in defiance of their bishop. Scot said what’s missing from these stories is that about 70 parishes closed and of them the people of 61 of them moved on immediately. And in the remaining parishes, 90 percent of the people have moved on to a welcoming parish. But there’s a very small group that remains and while their sense of community and commitment is laudable, their congregational impulse is wrong. Susan said the reality for the faithful Catholics of these three parishes is that these parishes were their spiritual homes and of course there’s a mourning when that home is gone. To not move on, though, to not realize that God is present and waiting for them in the next parish is a tragedy. It seems that the amount of time, energy, and anger that this has taken up is regrettable and it’s not going to change the situation. Scot said one of the arguments often made in these stories is that the Church only closed these parishes was for money, not for pastoral reasons. Scot said the leaders of the vigil in Scituate, who live right next door to the parish, claim that the archdiocese closed the parish to claim the 30 acres of seaside real estate, when some will point out that perhaps they are the ones who don’t want new developments built next to them. Fr. Roger said the Church is about the economy of salvation rather than the financial economy. He said in the early Church, the Christians sold all their property and laid them at the foot of the apostles with a real trust. Fr. Roger said Jesus didn’t us to love the building we worship in, but to love God. The building has become an idol. It’s sacred; Jesus was there; but now we’re called to follow Jesus, trusting in the apostles. He said the root of the word “parish” means “hostel” as in a temporary lodging on the journey, in this case to heaven.